N.B. This was drawn from imagination. I do not claim anatomical perfection, although anatomy can always be improved upon, especially with the help of references. 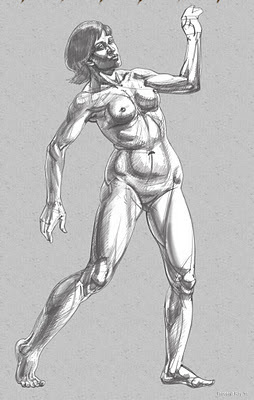 Nor is this a finished drawing, being merely a bare-bones, structural representation of the figure. I did not work upon surface details, things which breathe life and personality into the drawing... but that's a different issue altogether. 1. Draw the head - no details... just a helmet shape, with its visor (which is flat vertically, and curved from side to side) symbolizing the face area, and the rounded top as the top half of the head. 7. Indicate the outer extent i.e. widest part of the pelvis (drop verticals from the shoulders to help you do this,or just hold the pencil vertically in front of your eyes). The widest part of the pelvis is around midway between navel and pubic bone. And the navel is usually a little below the third 'head unit'. The entire figure is like 7.5 head units approximately. N.B. Note the curves in red (with arrow heads) - no curve in the figure's shape begins and ends abruptly at the 'outline' itself - they must be considered to be projecting into the substance of the body and emerging out of it on the other side, or whichever side its naturally curving to. This serves two purposes: 1) There is continuity or flow of shapes, one part can thus be related to another. 2) The point at which the curve exits can be used as an added reference to properly place the shape-segment in the general outline of the figure. ...just lines will suffice at this point. Indicate the inner aspect rather than the outer, since its closer to the mid-line and thereby easier to place. Also locate the heels w.r.t. the shoulders, i.e compare with verticals dropped from the latter. But more than that, see if the legs evenly balance the figure's weight. Unless its a mid-action pose, a vertical dropped from the pit of the neck (area in mid-line between clavicles) will pass mid-way between the two feet, or closest to the main weight bearing foot. 10. Bulge out the legs... it has a series of oppositely directed 'C' curves, curving forwards in the thigh, backwards in the calf region. 11. If its a female figure, you may draw the breasts now. 12. Draw the arms - as in the legs, start with the inner aspect first rather than the outer, since its easier to locate the inner side w.r.t. the chest contour. Again largely draw the arms' gesture/action/pose first, then flesh it out as necessary. 13. Don't get bogged down by fingers, fingers are not a priority as long as there are other things to take care of :) Draw the basic hand shape, indicating palm and the fingers area. (here's a pictorial tutorial on the basic hand shape). 14. And you have your figure! Wow I wish I could hone down on anatomy like you do ....inspiring as ever!! Very soon you will... you're already having breakthroughs at the atelier. Having said that, I know I'm still nowhere... the road is long :) Thanks for looking in.